By LUDWIG VON KOOPA - Going from region-locked games to region-locked people. One topic not covered in KoopaTV's 1,000+ article history — and just because I don't care about it — is the subject of region-locking. Did you watch the Nintendo Switch Presentation from three weeks ago? They had a line about region-locking no longer being a Nintendo policy starting with the Nintendo Switch, which apparently pleased some people out there. Nintendo has been region-locking their consoles for a while now, basically meaning that Americans can't play Japanese games imported from Japan on their American systems. Why anyone would want to do this to begin with is beyond me, because I'm not into playing games in foreign languages. I guess the only people who could possibly benefit from the removal of region-locking are Europeans? I dunno, you can tell me what benefits this actually has for the Nintendo Switch. While Nintendo is liberalising the export of games, the United States of America's new president, President Donald John Trump, is restricting the export of terrorists. More specifically, he signed Executive Order 13769, or Protecting the Nation from Foreign Terrorist Entry into the United States. This puts a temporary (few month) ban on nationals of Iran, Iraq, Syria, Somalia, Sudan, Libya, and Yemen entering the United States — until the Trump administration can figure out how to best set-up their vetting processes. So far, so good. After all, who wants people from Iran coming in? They're monsters who ban Pokémon GO and want to nuke America. Well, the problem is that the Executive Order seems to not have been written properly, and there is a lot of confusion about it. By LUDWIG VON KOOPA - They're either gonna love us, or ignore us. Or maybe despise us. I dunno. That makes KoopaTV quite in-line with GAB's values, so we signed up. It's an invite-only thing, but GAB approved of our application in about a week. They actually said when we signed up that it'd take a week for them to process our request, so they kept their promise. Good! That automatically makes them better than some of those OTHER social media services. Behold! 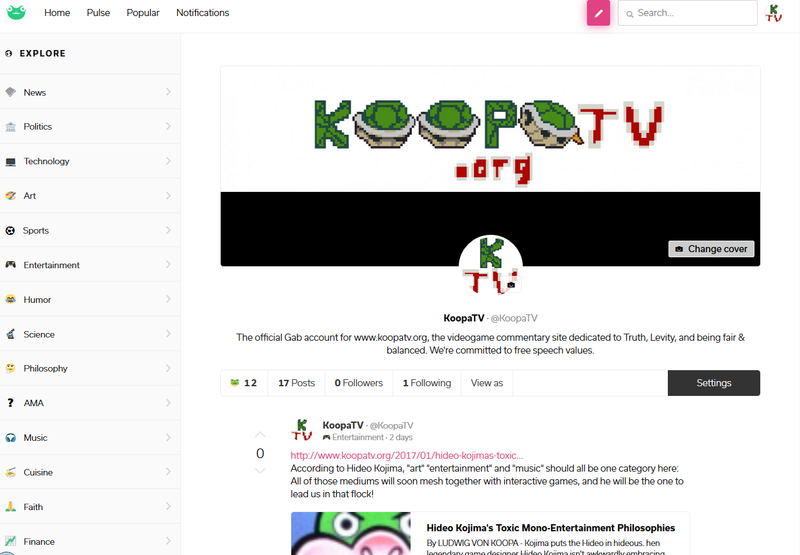 KoopaTV's GAB account is here at https://gab.ai/KoopaTV ! Screenshot of our GAB account taken this morning. We've had it for a few weeks but wanted to populate it first before advertising it. If that article about Hideo Kojima looks interesting to you, read it here. You can classify your post as Politics, Technology, Entertainment, and other things. Most of what we have is Entertainment, because it's literally a game controller icon. You get 300 characters per post, and after putting the url in it's about 240 — it's unlike Twitter which has a set amount of characters taken for every url (about 23). When making a new post, you can't upload an image file, but you can search Giphy to attach a .gif, which is something I haven't done because KoopaTV articles very rarely use .gifs. It'll take the first image it can find, which is the author avatar. So it's just a bunch of my face. If you want a GAB invite, KoopaTV can get you hooked up. Meanwhile, you can hook KoopaTV up with...yourself... and join KoopaTV as a social media manager! Ludwig sure doesn't want to be running all of these accounts by himself, and he sure isn't using them effectively. Have a big impact on KoopaTV's traffic with your knowledge and competence in social media. KoopaTV has updated the Knowing When We Update article for the first time in a year and a half, so check that out for a comprehensive list of knowing when KoopaTV has a new article! By LUDWIG VON KOOPA - Kojima puts the Hideo in hideous. When legendary game designer Hideo Kojima isn't awkwardly embracing Geoff Keighley, he's in Tokyo working for himself at Kojima Productions, currently trying to develop Death Stranding, a game we know nothing about other than that it's disturbing and inappropriate, reflecting Kojima's creepy fantasies. To be fair to Hideo Kojima, he's not saying he WANTS that kind of thing. That's just where he sees the entertainment industry going, and he's going to try to have a first-mover advantage into it. That said, he probably has that futuristic vision because it confirms what he's believed for years, not because he has any hidden insights or market research that the rest of the world doesn't have. So let's talk about it. By BRANDON WILLIAMS - The beauty of nostalgia is knowing a game is still great 20+ years later. IIf you’re a gamer, then you’re probably familiar with the feeling of nostalgia. Nostalgia is that strong sensation you get when you dust off your old copy of Pokémon Stadium, blow on the cartridge, and recreate your childhood team that helped you beat Gym Leader Castle, and it’s immensely satisfying for most gamers. Nostalgia is frequently brought up in discussions of classic video games, but it doesn’t have to be delegated to a spot in history. By building upon video games of yesteryear, new productions can capture that classic feeling while still updating the content for the modern age. Once upon a time, video games were produced with less-than-stellar graphics and considerable technical limitations. And they took the world by storm. While video games have made mountains of “improvements” from the days of Super Mario World, contemporary games could stand to benefit from some reintegration of classic trends. Don’t believe me? Just think back to the iconic features that made retro games so addictive. By LUDWIG VON KOOPA - ...It'd be funny. I sound like RawkHawk2010 right now, but it would be funny. ...Lemme back up a bit. 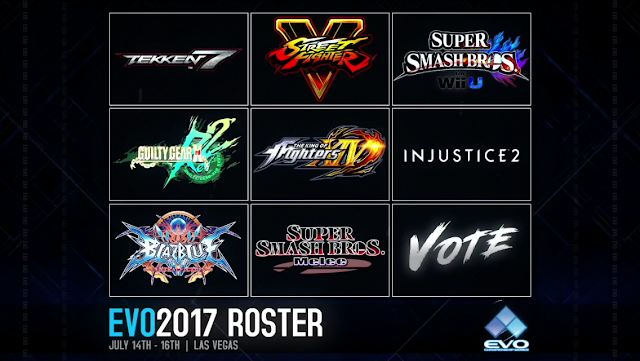 This year's Evolution Championship Series 2017, or EVO 2017, is taking place this July 14–16 in Las Vegas. It's the world's premier fighting game tournament. I've talked about it before. Multiple times. As the one dude on the staff who actually follows two eSports: Super Smash Bros. Melee and Super Smash Bros. For the Wii U. They're both gonna be at EVO 2017! Yay. We're gonna talk about that bottom-right box, ‘cause it's not a game called VOTE. However, this year, EVO is holding a charity drive contest (all proceeds to Make-a-Wish International): Nine games are nominated to be the COMMUNITY CHOICE game that people will then sign up for and play competitively. The game that raises the most money gets the slot, and the deadline is February 8th. These games all have established communities and fanbases... and then there's ARMS. By LUDWIG VON KOOPA - I'm just saying that Super Mario Odyssey shouldn't be a surprise to you, the KoopaTV reader. 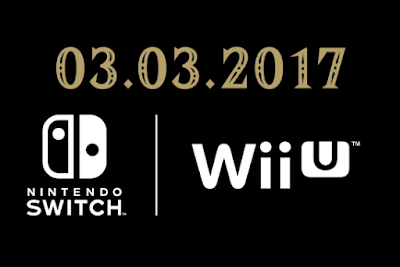 During the super-important presentation that Nintendo gave to us a week ago about the upcoming Nintendo Switch, it became apparent that the console will have two phases for 2017: Launch, featuring The Legend of Zelda: Breath of the Wild, and the holiday season, featuring Super Mario Odyssey. I have some comments regarding the former, but those are gonna be for next week. Let's talk about that trailer. By LUDWIG VON KOOPA - Less services, higher cost. 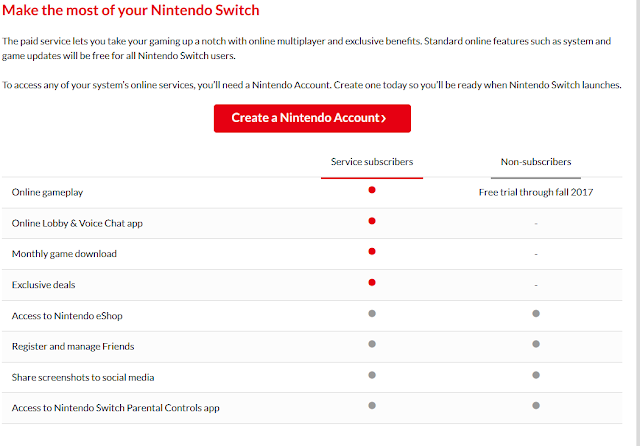 Among the immediate criticisms to come out of last week's massive and important Nintendo presentation on the new Nintendo Switch coming out this March, is that online services will now be on a subscription-basis. In other words, this brings Nintendo in line with the other console manufacturers. 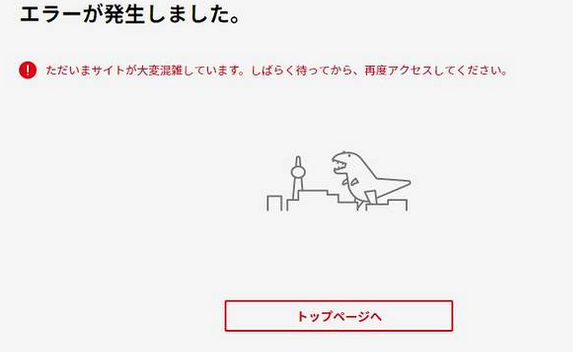 However, it's a new phenomenon for Nintendo users, and many don't know how to handle it. Myself included. Source: Nintendo's online service page for the Nintendo Switch. Assuming this chart represents everything the as-of-now-unspecified-in-amount-or-frequency subscription fees go to, there are some serious issues with it. That assumption may be flawed, since Nintendo's website says, “Check back for more details on the service and its features after the Nintendo Switch system launches.” Still, I'm going to commentate on what I got, on each row on their chart. Live Reactions to THE Nintendo Switch Presentation! By LUDWIG VON KOOPA - Now with the actual live reaction included! Plus, vindication of an earlier article. It's time to finally learn about the Nintendo Switch in-depth. We've waited a long time for this. It's time to separate the reliable sources you can trust (KoopaTV) and the FAKE NEWS sources that you cannot trust. You must learn not to trust them. Believe me. Read what happened and you'll know. I'm Nintendork 13 13, Rawk is himself, and Vortexica is breezinabout. By LUDWIG VON KOOPA - It's really a “fakedown” notice. How we know it's fake, and how to protect yourself. And then I was like, “WHAT?! NO!” when I saw the subject line: Takedown Notice Pursuant to the Digital Millennium Copyright Act of 1998. That's something that no webmaster wants to see. By LUDWIG VON KOOPA - Goodbye, President Barack Hussein Obama. ...Shoo. Your KoopaTV staffers live reacting to this once-in-a-lifetime event are Ludwig, as Nintendork 13 13, and Vortexica, as that breezinabout dude. Some people out there believe that 2016 was nothing but a disaster. KoopaTV, your source of boundless optimism (...lol), would like to disagree with you (if you think that way). And, so, we're going to prove there's lots of good in 2016: Not only from the gaming industry, but also KoopaTV itself... with our AWARDS! We will now begin with our videogame-related awards for 2016, which will include the Game of THAT Year 2016... and then move to KoopaTV's own set of awards for our site. It's all very prestigious and official, I promise you. And voted on by the staff members that bothered to participate. But yeah, this isn't just about gaming, but also ourselves. 'cause we're art to be recognised and applauded, too. This article is such a rehash of the 2015 one that I just drew over the 5 to make it a 6! By LUDWIG VON KOOPA - It's less of a drip feed and more of a digital content pump. Featuring Pokémon Snap as of today. Pretty much since the release of Paper Mario: Color Splash, Nintendo has had nothing new to offer Wii U owners. I mean, their Wii U release schedule between that and the release of The Legend of Zelda: Breath of the Wild slated for... sometime this year, is literally empty. HOWEVER! Just because they've had nothing NEW to offer doesn't mean they don't have OLD stuff! And that's not even talking about the NES: NES Classic Edition. (Well, that wasn't really “offered” in that no one could find where to buy one.) ...And I shouldn't talk about that, since this is just about the Wii U. By LUDWIG VON KOOPA - Observe the differences in enthusiasm pre-Brexit and post-Brexit. The Independent Game Developers Association, better known as TIGA, has released some highlights from their Business Opinion Survey 2017. Since we haven't talked about their 2016 survey, or any other survey from TIGA on KoopaTV before (they're like the United Kingdom version of the United States's Electronic Software Association, better known as the ESA), I'd like to briefly compare the headlines for the 2016 survey (released January 2016) and the 2017 survey (released January 2017 — aka now). I would hyperlink the press releases, but TIGA's Terms & Conditions on their website say I may not hyperlink to any page on their site besides their homepage at www.tiga.org. Other than having a great top-level domain, these guys (which KoopaTV has no association with) are a bunch of clowns when it comes to sharing information. Do you... see the difference between those two, besides the year at the end? The 2017 one is going to grow STRONGLY. The 2016 one is just growing with no further elaboration. Why? Because the 2017 results are actually good. By LUDWIG VON KOOPA - ...Probably, yeah. In an era where the talent cartel known as the SAG-AFTRA union is still making demands of gaming companies to this very day, one must ask: Is professional voice-acting worth it, given how expensive it is? How about voice-acting in general? What role does it play in the gaming industry? I mean, I guess there's some possible overlap (what if you voice-act in fights AND cutscenes but that's it? HUH, LUDWIG? HUH? ), and there's also the rise of what I call “partial voice-acting”, but we'll get into that and more in the article! I believe through exploring each of these, we'll figure out, together, what voice-acting is good for and perhaps then companies can really know if dealing with SAG-AFTRA and its ilk is worth it. Let's go! By LUDWIG VON KOOPA - Let's say good-bye to 2016 before we embrace 2017. It appears to be the popular consensus out there that 2016 was one of the worst years on record. I'm not fully on-board with that notion. Lots of cool stuff happened, but we'll get to that later. THIS is technically supposed to just review what happened in one of those twelve months of 2016 — though it also happens to be the last one, December. Of course, all articles on the site are worth reading. We're a quality outfit. But for December, it wasn't just things worth reading. We also published something worth PLAYING!